Gary Baseman making a return to the art collectable scene? Darn, right he is! Joining forces with APPortfolio to make the 2012 Ahwroo painting make the transition into Art Sculpture. 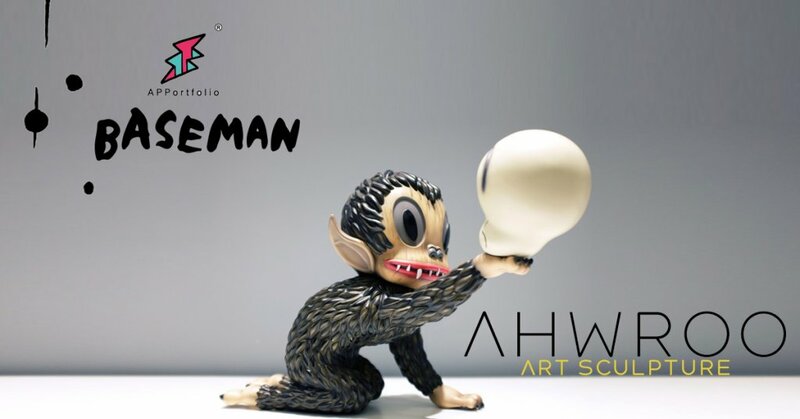 Today APPortfolio finally put all the rumours away and showed us all the official photos of Ahwroo art sculpture along with the release info that Gary Baseman fans have been searching for. Ahwroo was created in 2012. This role is similar to a monkey and also a monster. The cute and scary character, Ahwroo, bears his snaggle-toothed grin to express his want of attention. If he doesn’t get it, he just might scratch and draw some blood. He not only needs a lot of attention but also hides the complex and contradictory aspects of human nature. Needless to say, the creation of Ahwroo is definitely one of a kind. The meticulous details of painting and the natural form of the first-class engraving technology feel like Ahwroo is in front of us!! APPortfolio, an Asia art organization promoting contemporary art, has a long-term commitment to bring more contemporary art and crossover projects to the publicities. Pervasive art master Gary Baseman jointly launched exotic and distinguished “Ahwroo” sculpture, each with a separate number certificate, the number of sales is used to support promoting the development of Asian cutting-edge artists. 10pm (EDT), JUN 11 / 10am (HKT), JUN 12 Shipping available worldwide. Stay tuned with the latest APPortfolio art sculpture- Ahwroo. More and more unexpected surprises will release! Gary Baseman is a Los Angeles-based artist. He explores the “beauty of the bittersweetness of life” through painting, performance, film and fashion. His very recent projects include a collaboration with COACH; a documentary “Mythical Creatures” about his family heritage; and a traveling retrospective that featured hundreds of his paintings, photographs, videos, and toy and costume designs. Baseman’s multifaceted career includes illustration for clients including the New York Times, Rolling Stone, and the Wall Street Journal and the bestselling board game Cranium; as well as animation for which he created the Emmy and BAFTA award-winning ABC/Disney series “Teacher’s Pet.” He is a frequent speaker at international conferences on graphics and multidisciplinary arts and visual communications.